There is something so very Sydney and wonderful about travelling by ferry. And it's a great way to travel with kids. They can wander around, enjoy the sights and nature spot. Plus there are so many great spots to visit along Parramatta River. 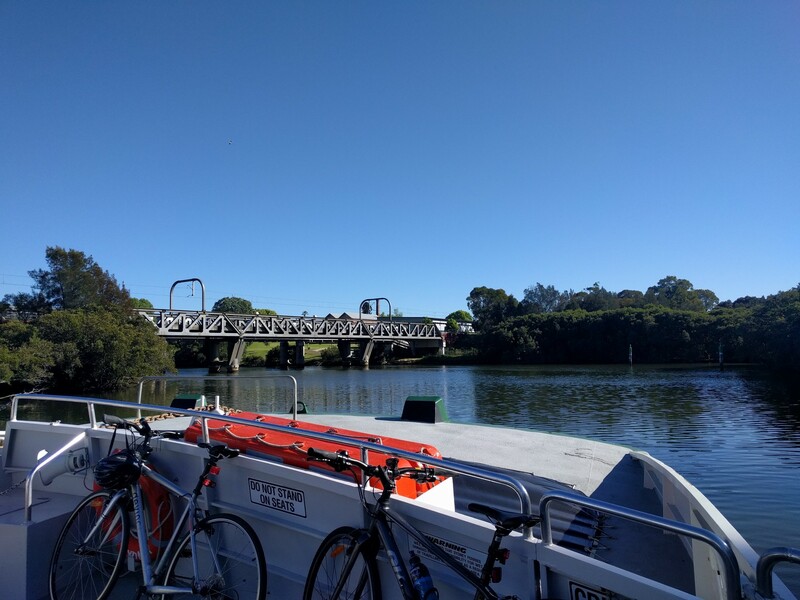 We are fortunate to have many wonderful ferry stops along Parramatta River, with lots of great parks, playgrounds, swimming spots and picnic facilities nearby. Most are perfect for family gatherings and all are great places to enjoy being outdoors. 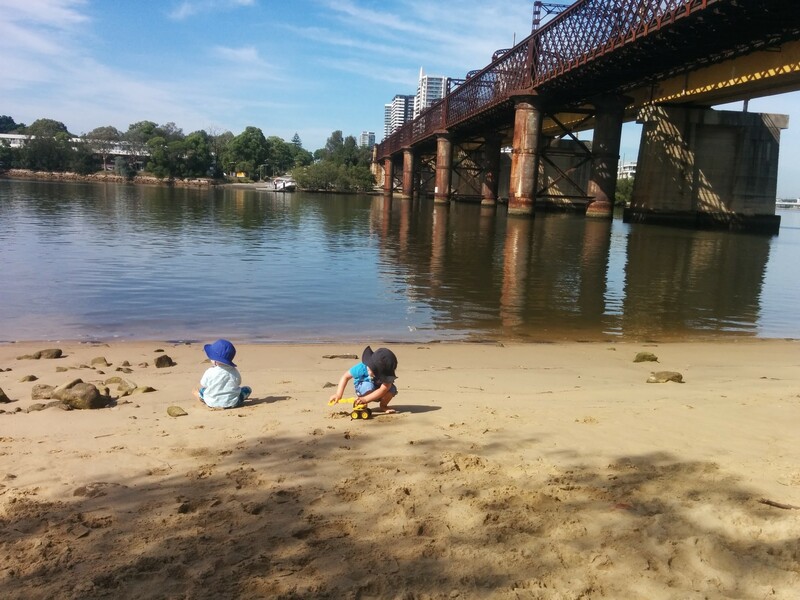 So why not take advantage of living near Parramatta River and go on some wonderful ferry adventures with your kids! 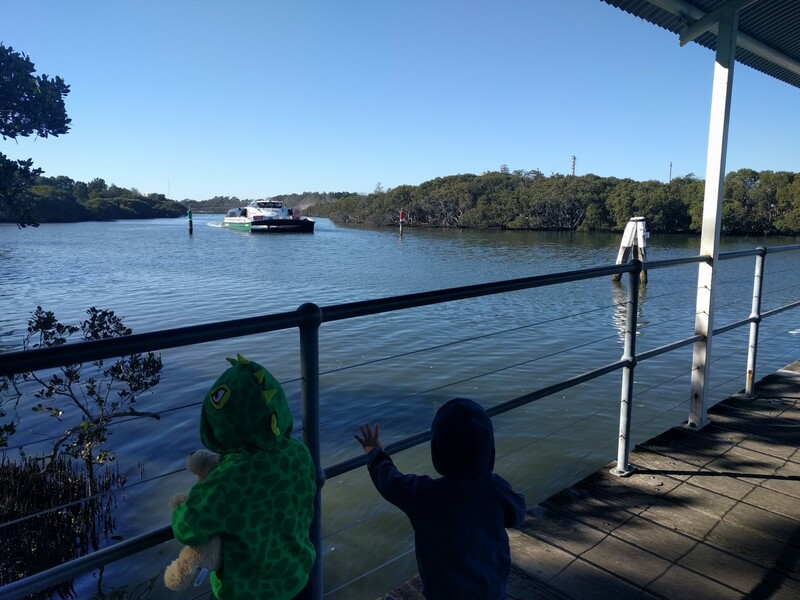 I used to take my little ones from Rydalmere to Meadowbank, when we first started our ferry adventures. And I would push the pram around to Meadowbank Park for a play at the fenced, shaded playground there. We then started to travel to Cabarita and would spend a whole morning playing at the playground and going for a swim. 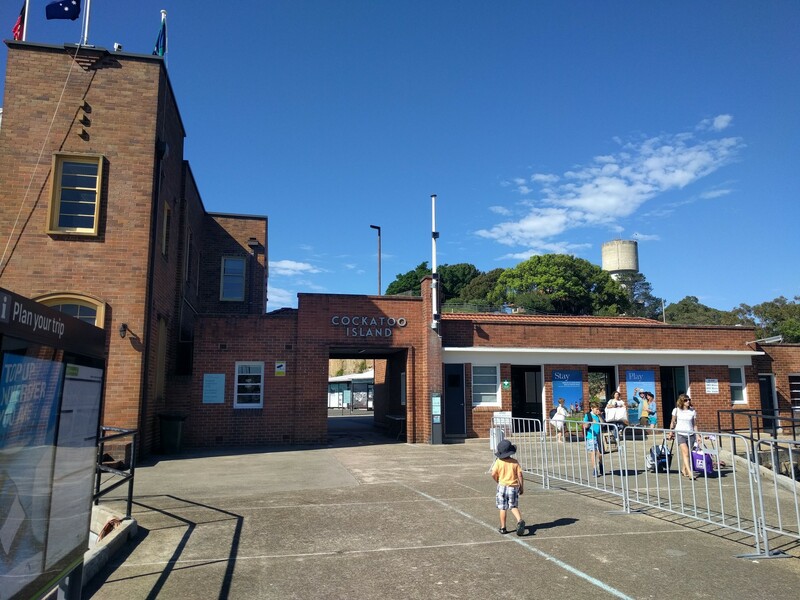 Now we regularly like going to Cockatoo Island and Darling Harbour, but now leave from Meadowbank or Kissing Point wharves. Below is a list of family friendly places to visit via the Parramatta Rivercat. They are grouped by ferry wharf, starting at Parramatta and travelling down river. Most are within 1km of the wharf, but in some cases I have listed places to visit up to 2km away. These should be fine to reach with older kids, if your kids are in a pram or you are riding bikes. At the end of the article is a Google Map, with all the locations marked, that you can load onto your phone. Depending on where you live, you can either go up or down river and make the trip as short or as long as you like. 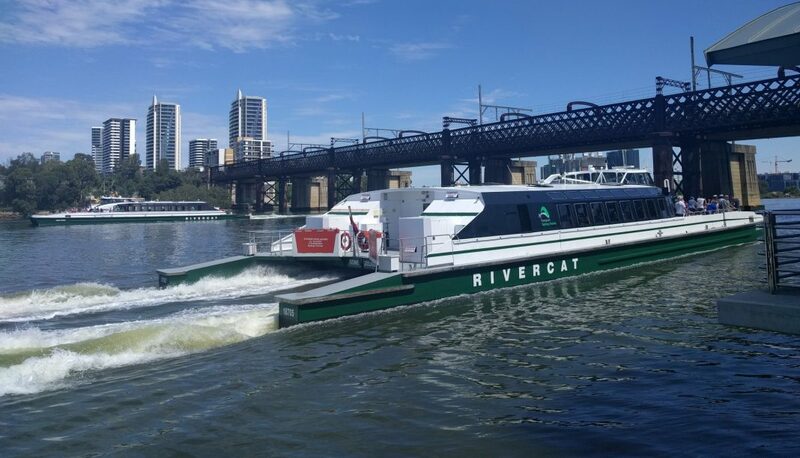 It’s just a shame the Parramatta Rivercat only runs every hour from Parramatta and Rydalmere and every 30mins from Sydney Olympic Park and all other stops down river from there. Tickets are no longer sold on the ferry. You will need an Opal card to ride or purchase a single ticket at the wharf from an Opal machine. On Sunday, you can ride all day for only $2.70 per adult. Children aged 3 years and under travel free. It’s common on weekends for the ferry to be full after Meadowbank wharf and not pick up anymore passengers into Barangaroo/ Darling Harbour. There is room on board the ferry to park/ store prams. Side by side prams greater than 74cm wide will need to be collapsed to board the ferry. It’s rare to get a Rivercat with baby change facilities but we have found a few. Darling Harbour wharf is no longer operational. The Parramatta Rivercat stops at Barangaroo wharf instead, which is about 100m from the old wharf. This is the beginning/ end of the river for the Parramatta Rivercat. From 9am daily, it departs every hour at 38 minutes past and returns at 33 minutes past. The trip to Barangaroo takes about 75mins. NOTE: sometimes at low tide, buses replace the ferry between Parramatta and Rydalmere wharf. 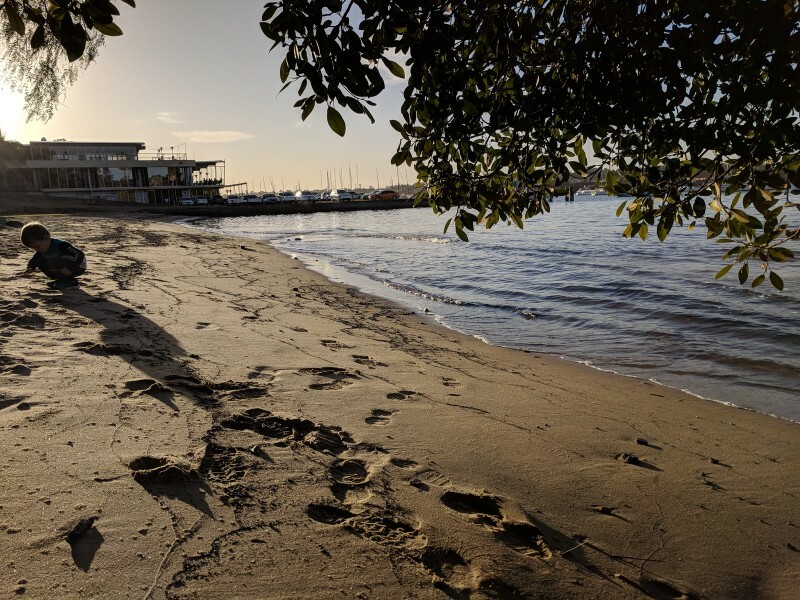 Parramatta River Foreshore Reserve: Here you can literally take a walk through the history of Parramatta, via the pavement art, and enjoy the beauty of the river. It is a tranquil spot to sit, there is the Barry Wilde Bridge water fountain (one of only three in the world) and an adventure playground for kids. 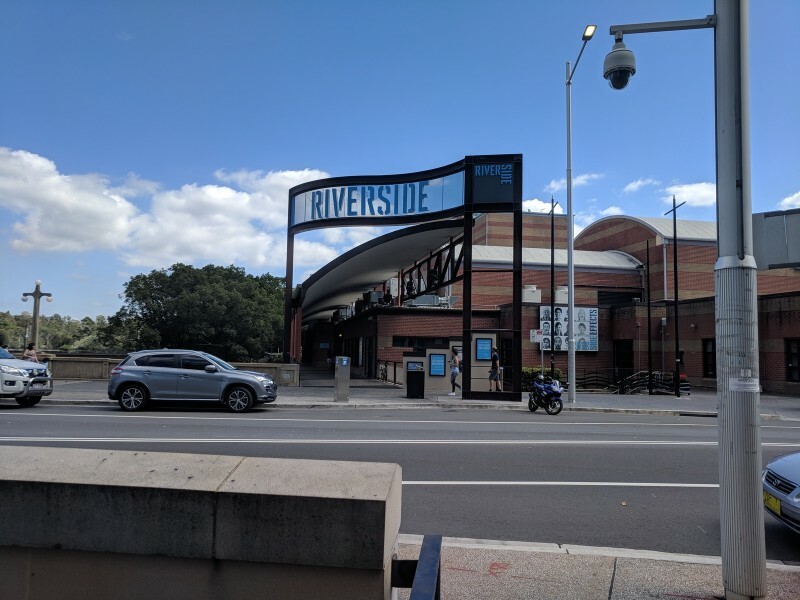 Riverside Theatre: Home to 1200 events every year, Riverside Theatres offers an exciting variety of professional live theatre, dance, comedy, film and musical performances. They regularly have shows for kids and Riverside’s courtyard is a great space to wait before a performance. 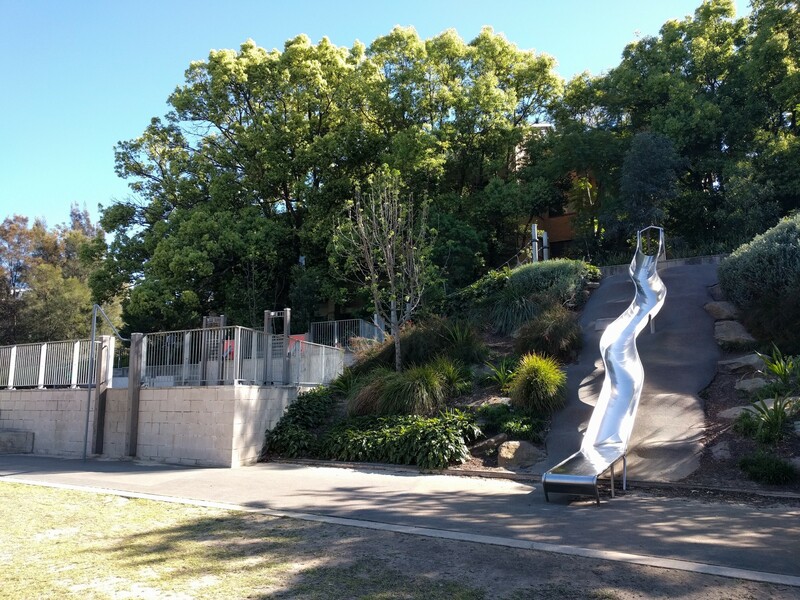 Parramatta Park: Home to many great events, the 85 hectare parklands have a pretty cool nature based playground at Domain Creek. Unfortunately the cafe by the river closed due to a fire in December 2016. But thankfully The Grounds Keeper Cafe opened in the George Street Gatehouse, near the Pavilion Flat playground in June 2017. Church/ Eat Street: Parramatta’s most popular eating hub, there is a wide selection of international cuisine on offer; Italian, Mediterranean, Chinese, Thai. Two we recommend visiting are River Cafe and Bay Vista Dessert Bar. This is our local wharf and it’s located in the industrial area of Rydalmere. There’s now a picnic shelter with bbqs near the wharf, with a lovely view over the river. And toilets will be built in early 2019. Plus, there are a few cafes, parks and Aldi within walking distance from the Rydalmere wharf. We have always been able to get a car spot in the carpark and there’s also street parking nearby. 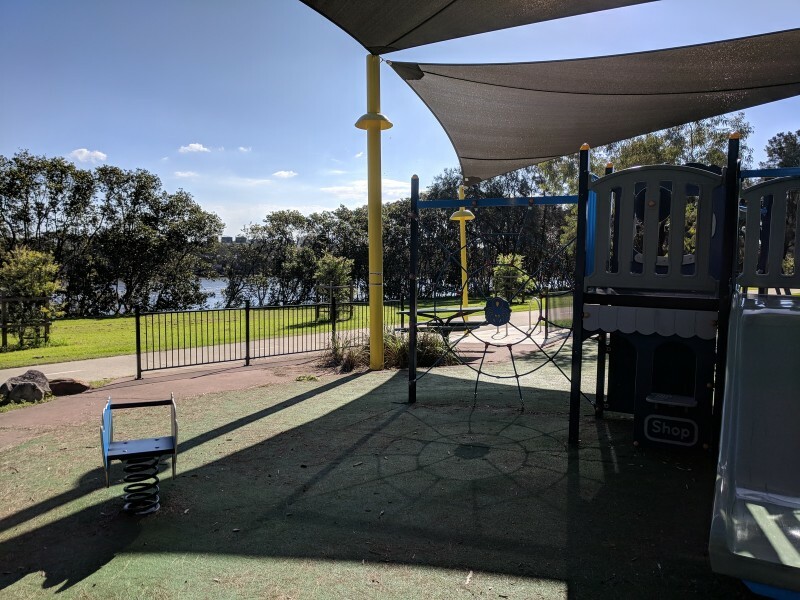 Eric Primrose Reserve, Rydalmere: Just to the east of the wharf, is a reserve with a small playground, plus picnic facilities and scooter track are currently being constructed. 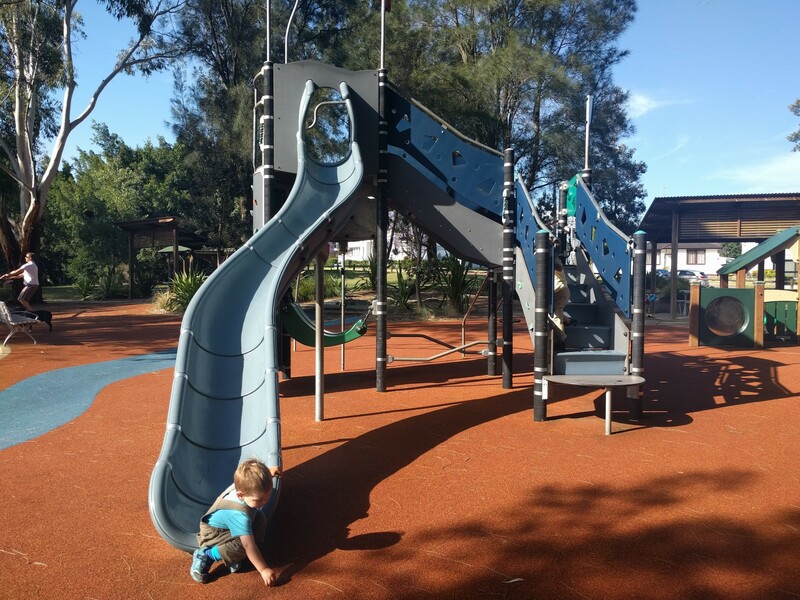 Rydalmere Park, Rydalmere: This medium sized nature based playground has a range of wooden play equipment. It is located within a 6.3 hectare park that is a popular sporting venue. Unfortunately it lacks any shade and so is best visited early morning or late afternoon or in the cooler months. 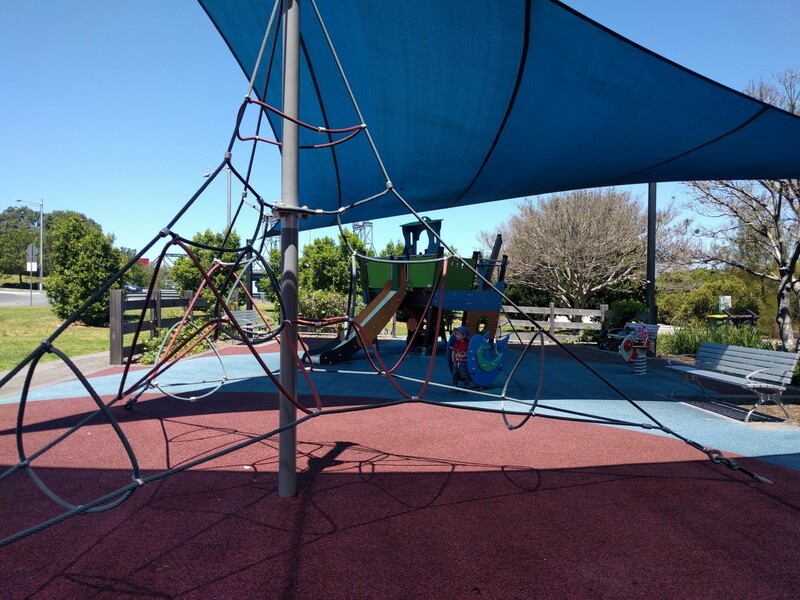 Hannibal Macarthur Park, Rydalmere: small, local playground with a path for riding on and ball hoop basket. 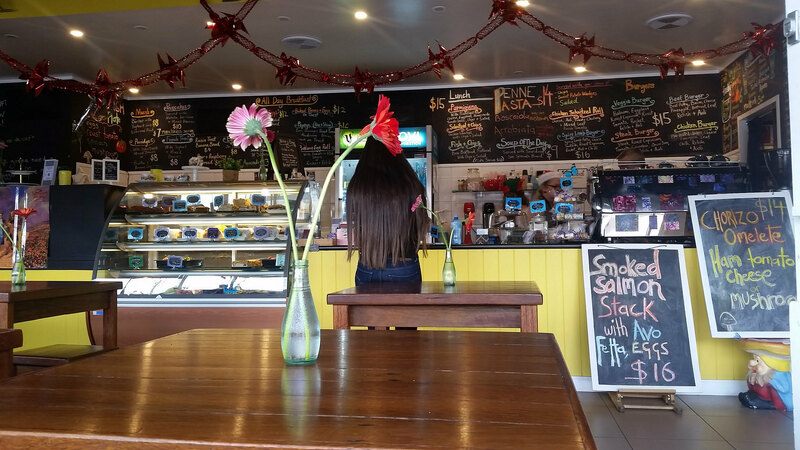 Caleidoscope Cafe, Rydalmere: This kid friendly cafe on Park Road, near Victoria Road, has some toys and books for the kids, plus a lounge to relax on. The owners are lovely with the kids and may even offer some stickers. 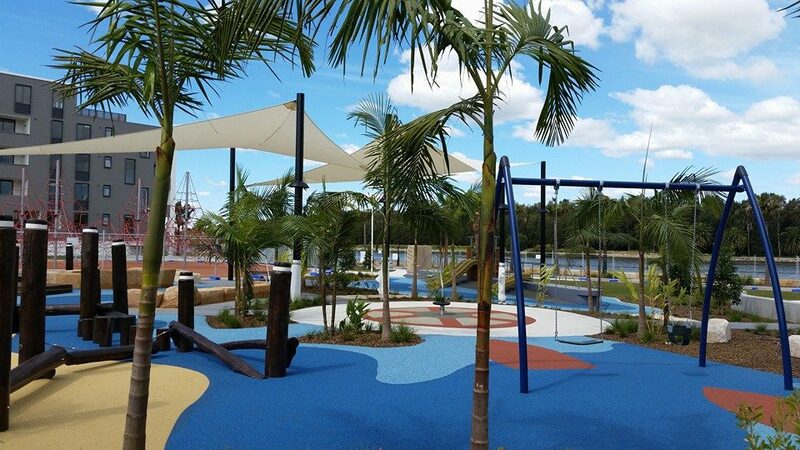 Halvorsen Park, Ermington: About 1.8km east of the wharf is a wonderful, new nautical theme playground. It can be reached by walking/ cycling along the scenic path along the river. 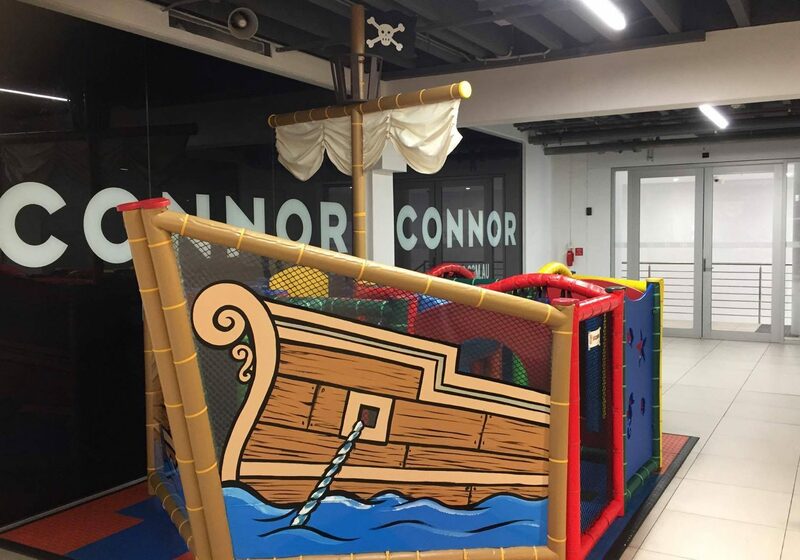 It is best suited to toddlers and preschoolers but there are a few things to keep older kids entertained as well. 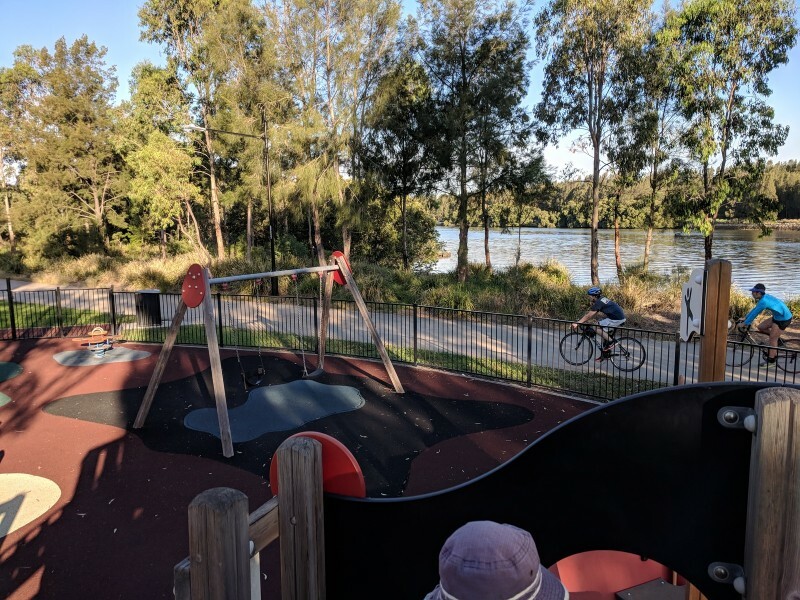 River Park, Ermington: River Park is a great little fenced playground just east of Halvorsen Park and west of the large George Kendall Riverside Park. There is boat themed equipment with swings, slide and cubby houses. There is a ferry service that starts from Sydney Olympic Park wharf to Circular Quay every 30mins. The wharf has recently been upgraded and there’s now Marina Square right near nearby with shops and cafes. The wharf is serviced by buses and you can park at Marina Square for 3hrs for FREE. 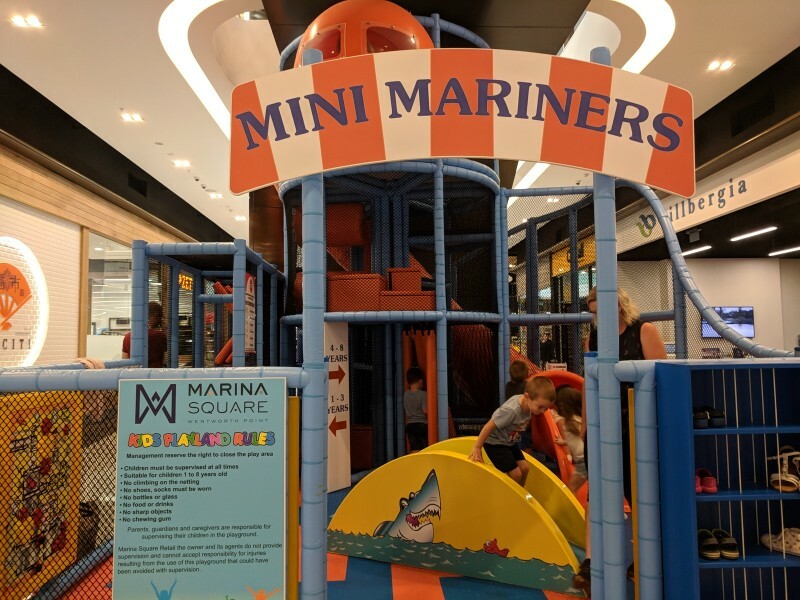 Marina Square, Wentworth Point: This new shopping centre has a kids play area, a few cafes, Coles and a number of small speciality shops. 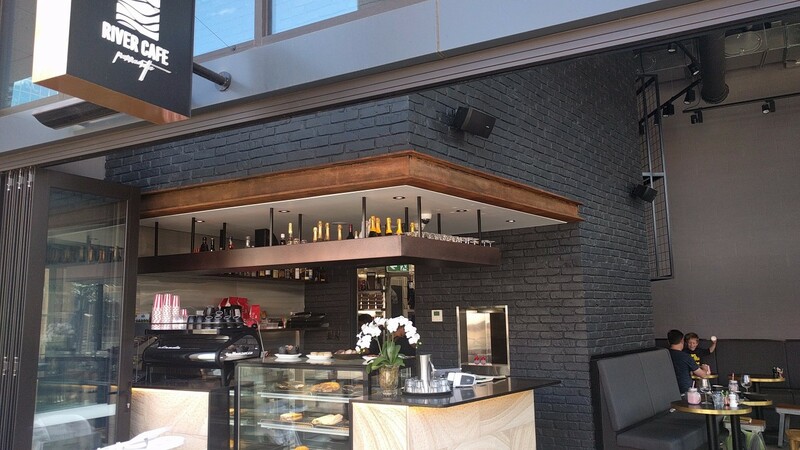 The Aviary Coffee House, Wentworth Point: The are a few new cafes at Wentworth Point worth checking out before heading over to Rhodes via the Bennelong Bridge. 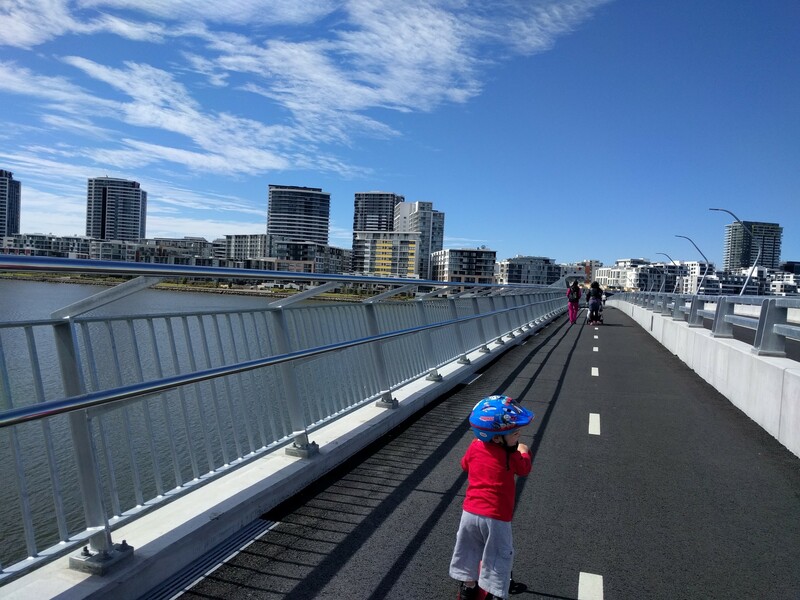 Bennelong Bridge, Wentworth Point to Rhodes: The Bennelong Bridge connects the new and rapidly growing suburb of Wentworth Point with Rhodes and is only for pedestrians, cyclists and buses. It is only 300m long and has a few rest stops along the way, plus lovely views out over the river and Rhodes. 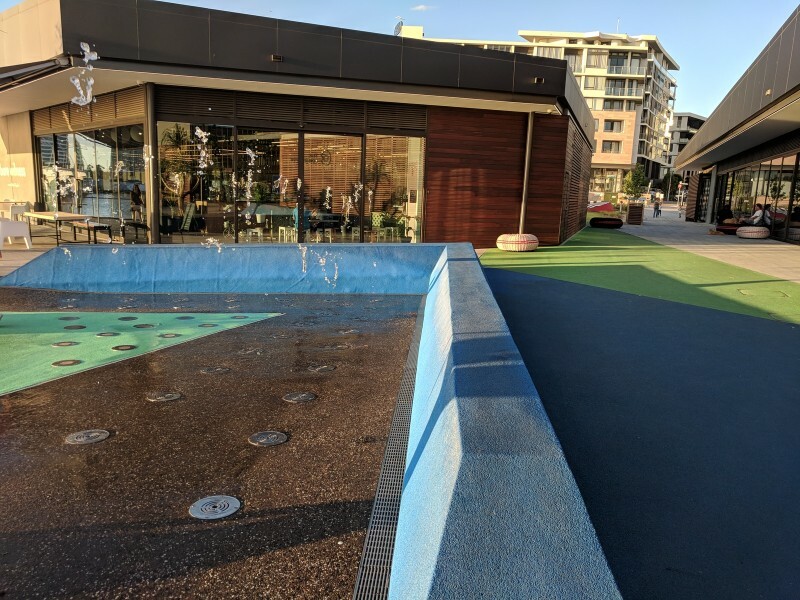 The Connection, Rhodes: This community facility is stunningly located on the Rhodes foreshore, right next to the new Bennelong Bridge. The Learning Space specialises in the latest technology digital library resources and creative programs. Plus, there are water fountains outside. Bare Witness, Rhodes: This cafe has amazing water views, great, family friendly service and divine food. Rhodes Foreshore Park, Rhodes: New fenced playground, with some shade, next to The Connection Rhodes. Phoenix Park, Rhodes: The colourful and artist inspired Phoenix Park was opened at the beginning of 2016. It features a wonderful medium sized playground as well as plenty of bbq and picnic spaces, iconic artwork and paths. Rhodes Waterside Shopping Centre: Home to Ikea, Rhodes Waterside is a lovely, family friendly shopping centre. 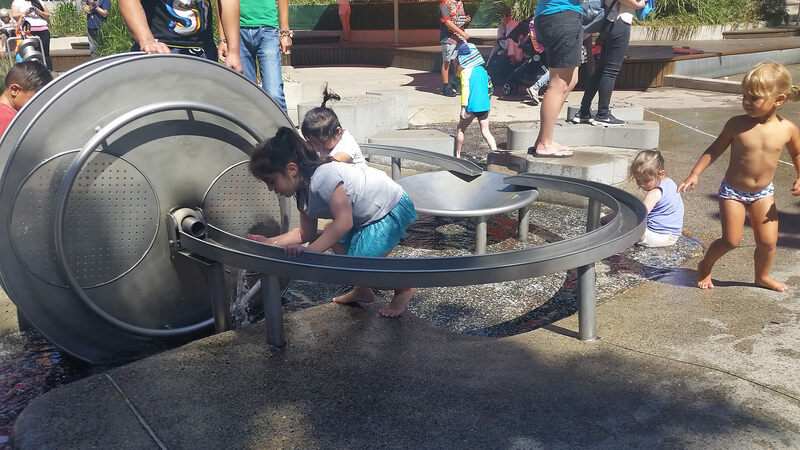 There is a free monkey bar playground near kid friendly cafes, plus the play area in Ikea. 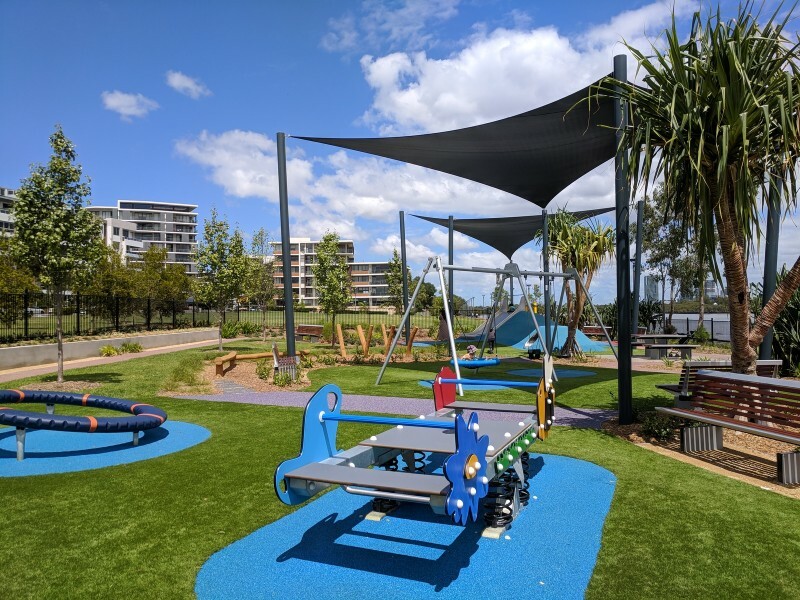 Blaxland Riverside Park, Newington: This park is huge, spread over 3 hectares with lots of play equipment best suited for 4yrs+. There is a good walking/cycling track and you can even hire bikes here. The Armory Wharf Cafe is a great spot for lunch right by the river and there is also another kiosk within the playground area. This is where we mainly drive to now to catch the ferry. We have been mostly fortunate to always get a car spot, but usually it’s the last one. There is more parking a short walk away at Aldi or Meadowbank train station is nearby as well. 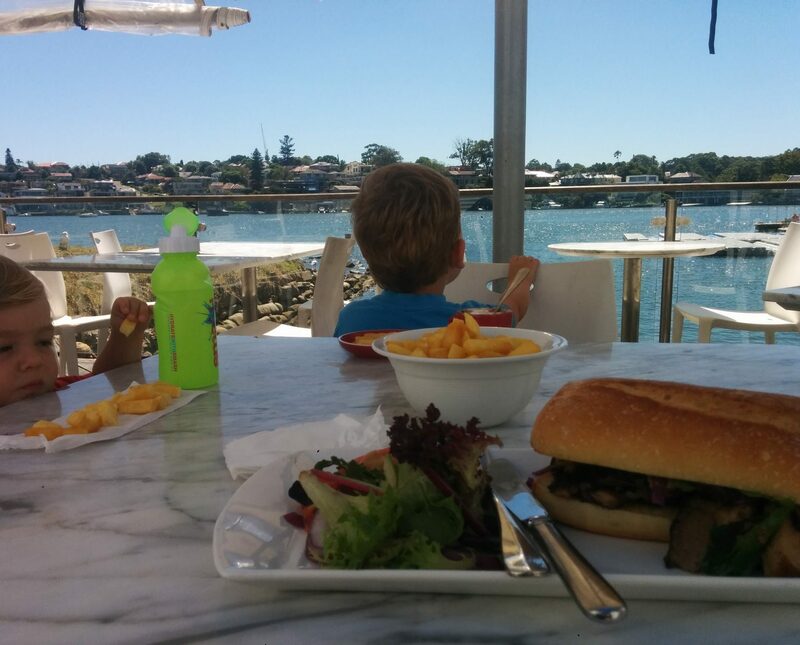 Medrock Bar & Grill, Meadowbank: This restaurant is right near the wharf and is open for lunch and dinner. There is indoor and outdoor seating and we look forward to giving it a try soon. 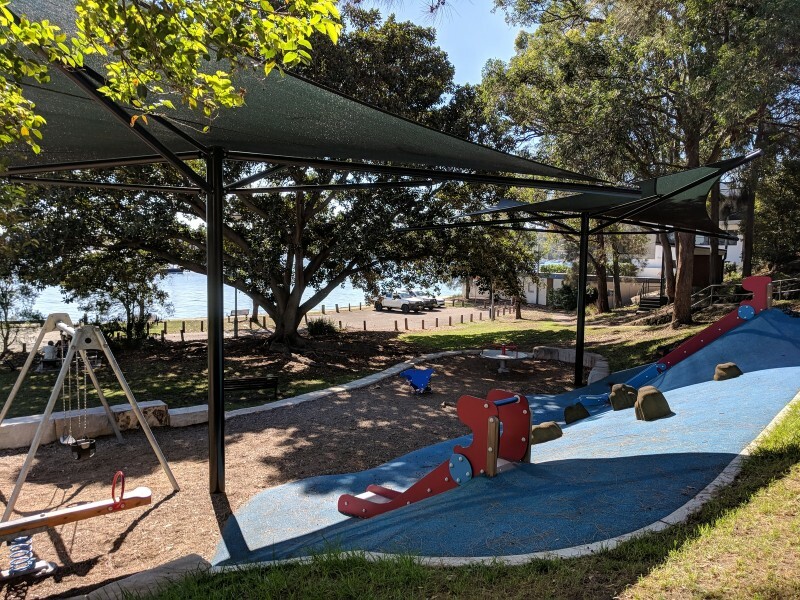 Memorial Park, Meadowbank: The lovely, tranquil bushlands of the park contain a great nature based playground, bbqs, picnic facilities and a war memorial. 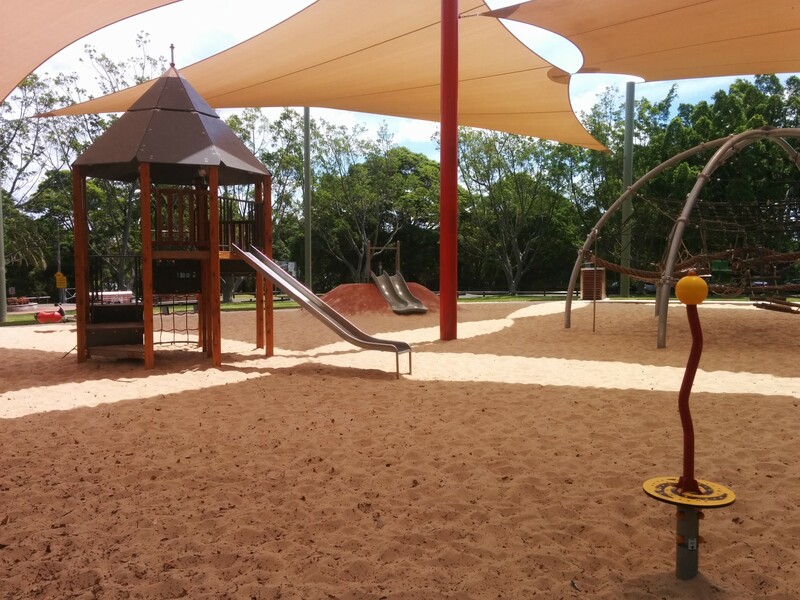 Meadowbank Park, Meadowbank: The large Meadowbank Park has four playgrounds set amongst 10 sporting fields, tennis courts and netball courts. There are lots of path to ride and walk on, wide open spaces and picnic facilities, plus a nice breeze off the river. Note: the fenced playground near Adelaide Street was burnt in February 2018 and needs to be repaired. Anderson Park, Ryde: Has a shaded, medium sized playground, with a boat themed climbing play gym, swings and small rope climbing tower. This is a gorgeous spot for watching the sun set and we have enjoyed a few bbq dinners here. There is some parking at the wharf and also at another carpark on the other side of Kissing Point Park. It is common for the ferry to not stop here so make sure the approaching ferry can see you on the wharf or you let the crew know you want to get off here. And we are super keen to see ‘Putney Beach’ become a safe swimming spot! Kissing Point Park, Putney: There is play equipment here for a range of ages. 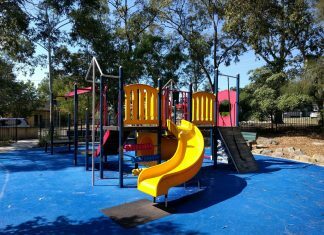 With a sandpit and digger, swings and cubby house for the little ones and a tall climbing gym for slightly older kids. There are also toilets, bbqs and picnic shelters. Putney Park, Putney: This beautiful park has lovely views of the river, two great playgrounds, a water splash area and plenty of places to have a picnic. I have lost count of how many wonderful trips we had made to Cabarita by ferry in the last few years. There are a variety of things to do there with little and bigger kids and a cafe as well. 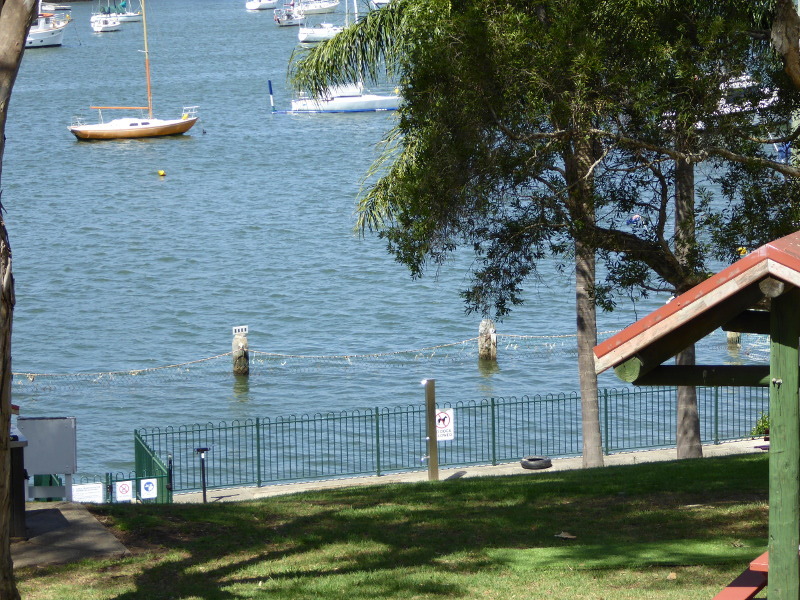 Cabarita Park, Cabarita: The shaded playground is at the top of a small hill, about 5mins from the wharf. It has a sand base and equipment for a range of ages. 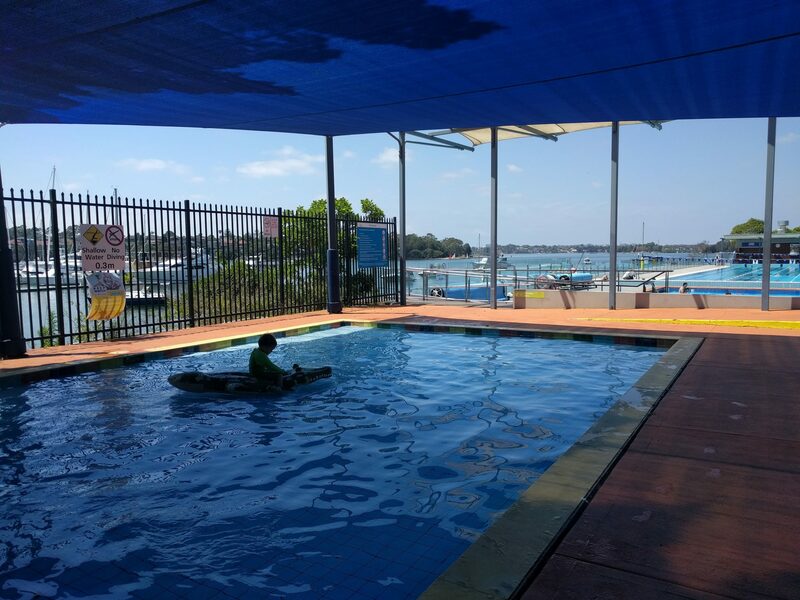 Swimming Centre, Cabarita: I fell in love with this swimming centre when I had 2 under 2. It was the only one I felt comfortable going to on my own with my boys. The toddler pool is shaded and has a consistent shallow depth and is separated from the other pools. There are gorgeous views over the river and grass to spread out on. 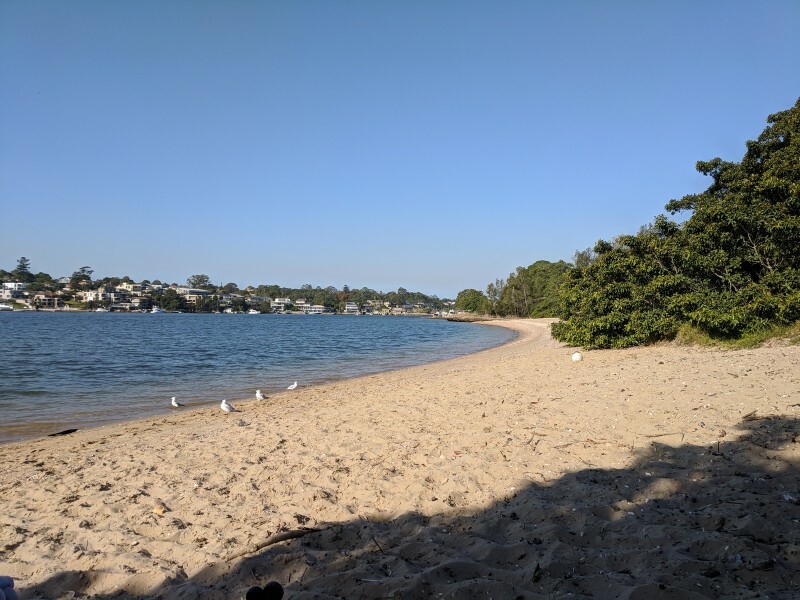 Cabarita Beach, Cabarita: This is the closest beach to Parramatta and was only recently deemed swimmable with significant improvements in the water quality. The beach is to the left of the wharf when exiting and we prefer to go right to the other end where there is shade and rocks to explore. The beach is literally covered in shells. Abbotsford Ferry wharf re-opened in June 2018 after being upgraded. There’s the lovely Watergrill restaurant at the Sydney Rowing Club right next to the wharf, with gorgeous water views. And just around the corner is the fun Battersea Park. Sydney Rowing Club, Abbotsford: You can count the number of riverfront restaurants on your hand sadly. 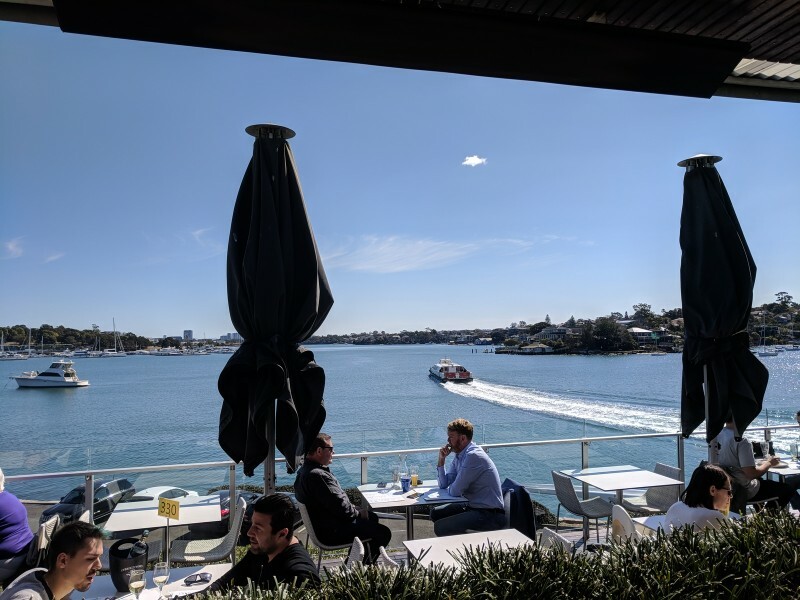 And Watergrill at the Sydney Rowing Club probably has the best views and is such a lovely spot to enjoy a long lunch or dinner. Battersea Park, Abbotsford: With a waterfront backdrop, the playground is set back just far enough from the water. There are slides and swings, with soft fall ground and shade sails. Nearby is a covered picnic table and bubbler. The Chiswick Wharf was upgraded in mid 2017. And is now pram and wheelchair friendly. Chiswick Baths: The baths are a free, netted, unpatrolled swimming spot about 25m long and 10m wide. At low tide, there is a small beach area for the kids to play in the sand. I used to live at Drummoyne a long time ago and have fond memories of catching the ferry into work from there. The ferry wharf is in the residential area but only a 600m walk to Victoria Road and the nice stretch of shops and cafes there. 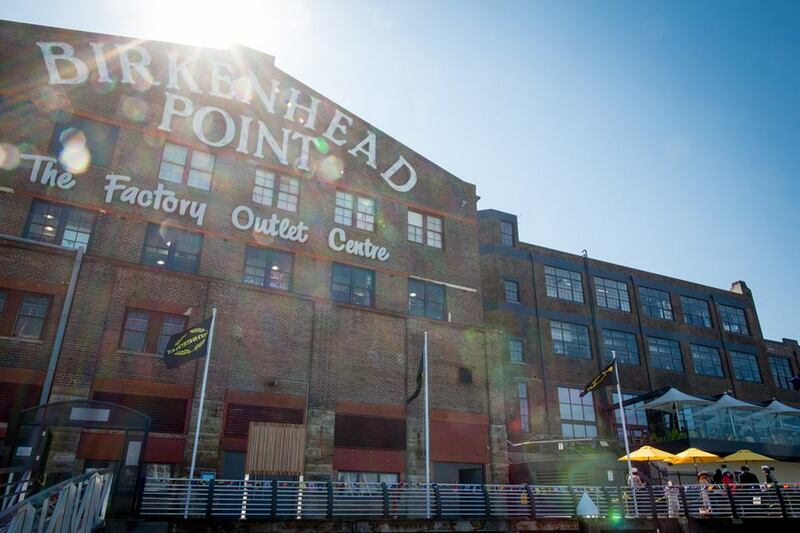 Birkenhead Point Outlet Centre, Drummoyne: There are over 120 retail shops here, plus three play areas. The newest one is on the ground floor. 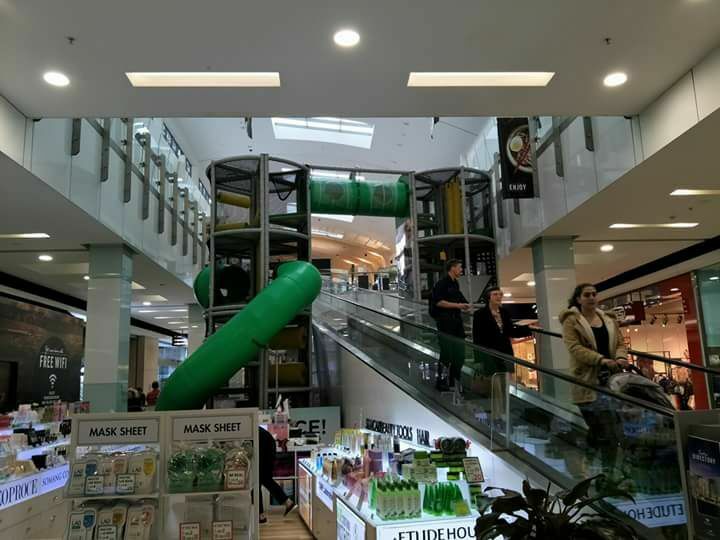 It’s called the Lighthouse Playgym and has a spiral slide and gadget panels. The marina out the front is lovely to walk around. 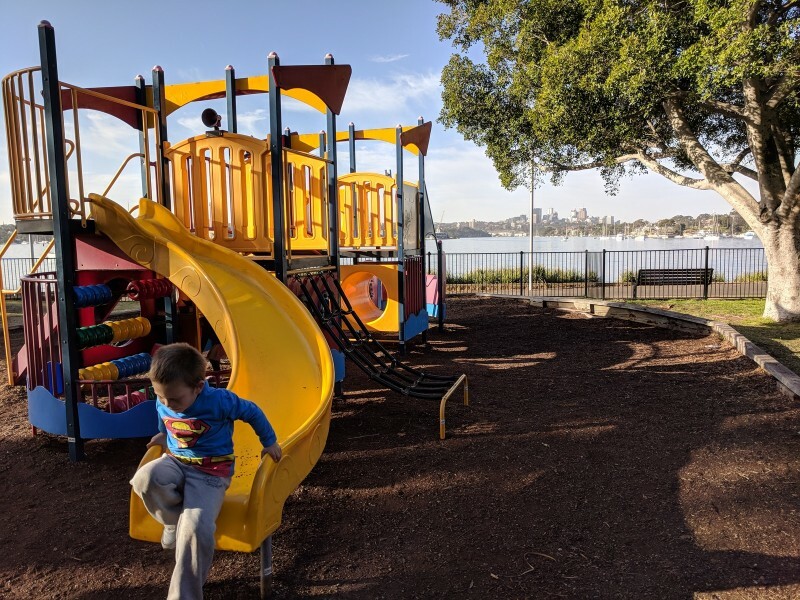 Dunlop Reserve, Drummoyne: This park, in front of Birkenhead Point Outlet Centre, has one a lovely view of Sydney Harbour. There’s a fenced playground with boat themed play equipment. Drummoyne ‘Beach’: In between Dunlop Reserve and the Drummoyne Sailing Club, is a small ‘beach’ with a lovely view out to Cockatoo Island. Unfortunately water quality isn’t monitored here, and it’s not a recommended swimming spot. But it is fun to build sand castles on and splash your feet. 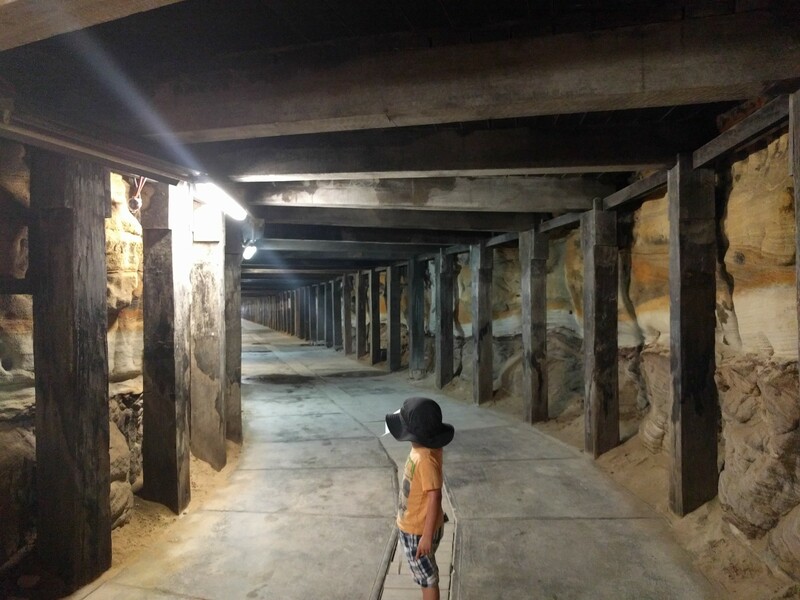 At the mouth of Parramatta River, is the UNESCO world-heritage-listed Cockatoo Island that is free to visit. This truly is a gorgeous spot and we have really enjoyed our few visits there. My little ones particularly love watching the steam crane demonstrations. 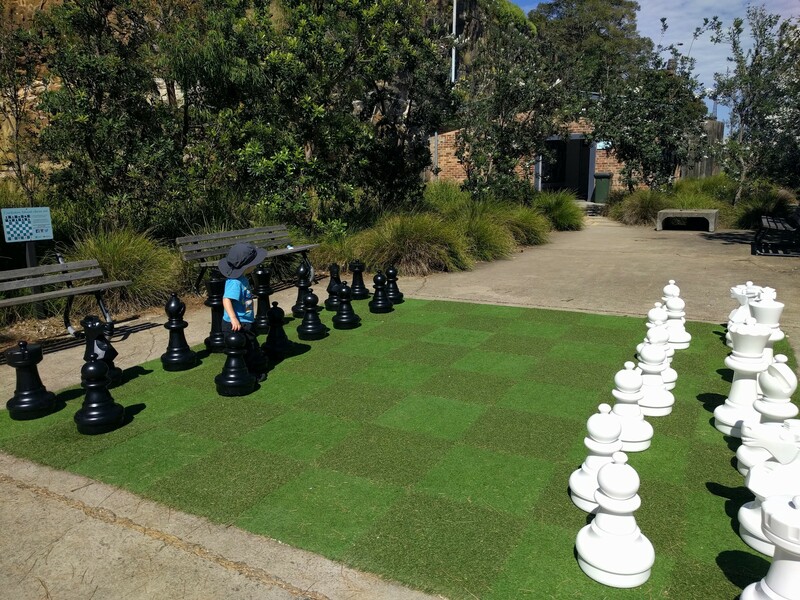 Then there is hanging out on the bean bags at the cafe, running through the tunnel and playing with the chess board. Plus, they regularly have free kids activities on the Island (like the 1st Saturday of the month and during school holidays). For older kids, there are treasure maps to follow around the Island. You can get more information from the visitor centre, near the ferry wharf. 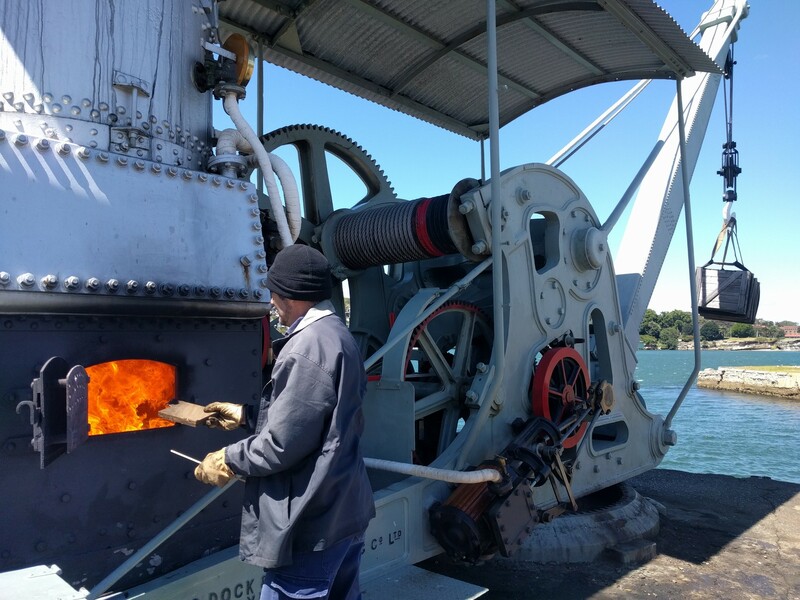 Note: the steam crane demonstrations only run on certain days. From July 2017, the Parramatta Rivercat stops at the Barangaroo Wharf. It’s about 100m away from the now closed Darling Harbour wharf. 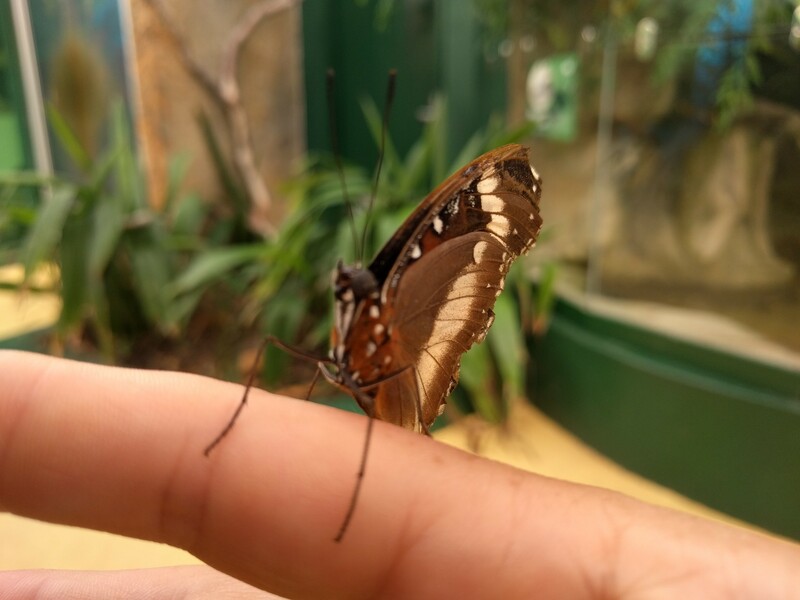 Wild Life Sydney Zoo: This is one of our favourite indoor activities at the moment. We love seeing the new crocodile and enjoying storytime at 11:30am. We recommend getting the Merlin Annual Pass to make visiting great value for money. 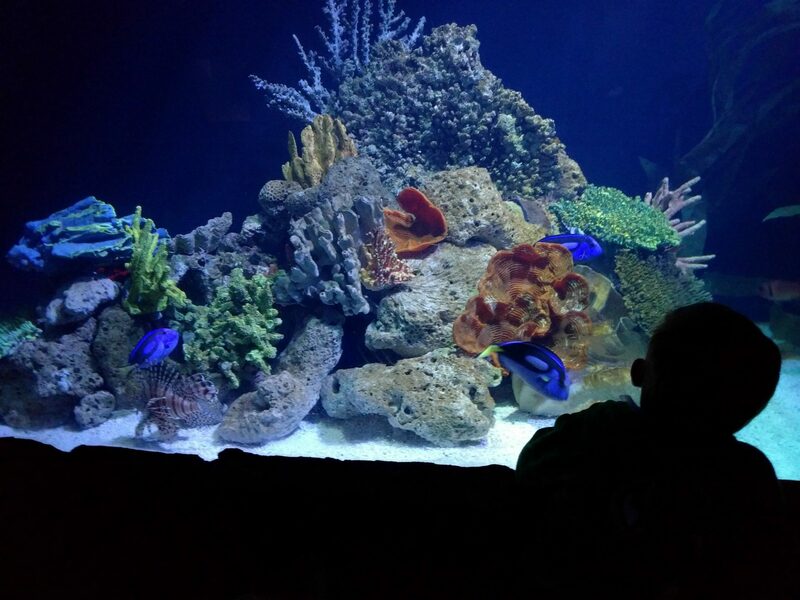 Sydney Aquarium: Sea Life Sydney Aquarium takes you on a wonderful underwater journey. Along the way you’ll encounter beautiful dugongs, huge sharks, massive sawfish, mysterious stingrays, jellyfish, penguins, seahorses, thousands of tropical fish and much, much more. Again the Merlin Annual Pass makes it a lot cheaper to visit. Australian National Maritime Museum: With the combination of indoor and outdoor exhibitions, you can visit rain or shine. 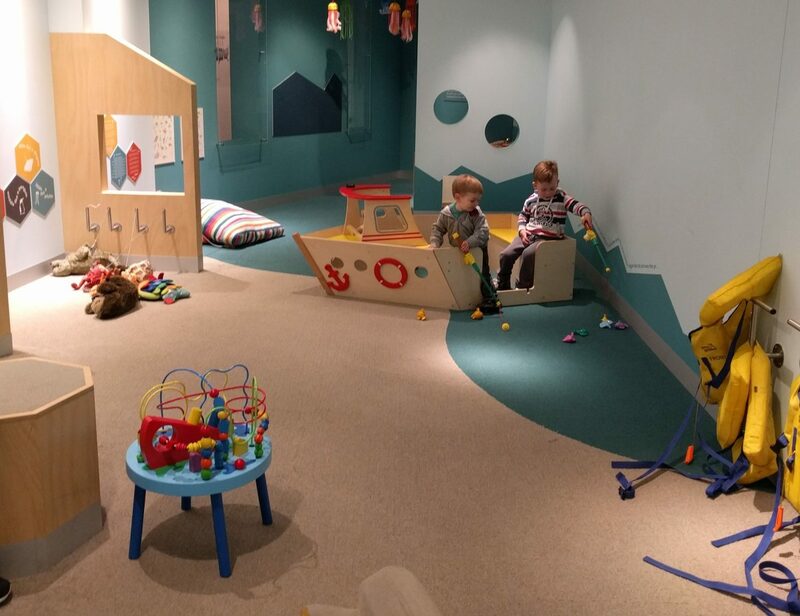 Entry to the mini mariners under 5 play space and permanent galleries is free, so your visit can also be a very cheap one. Barangaroo Reserve: Just a short walk from Darling Harbour, Barangaroo Reserve is Sydney’s newest Harbour side park. You can explore the reserve by bike, skateboard or scooter, splash in the rock pools or enjoy the harbour views. There are daily Aboriginal Cultural Tours and a dining precinct nearby. 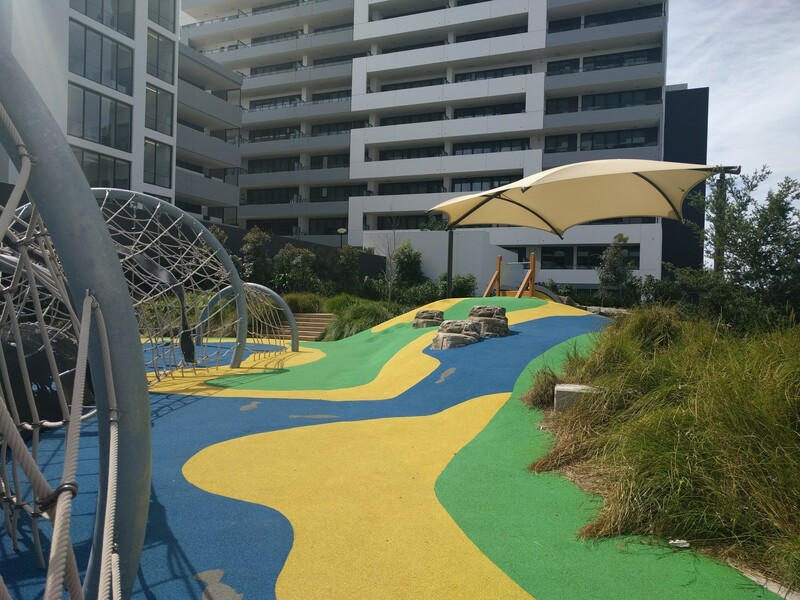 Darling Quarter Children’s Playground: This large playground has a fab water play space, sand pit, large slide, swings and lots lots more. Chinese Friendship Gardens: The gorgeous walled Chinese Gardens recreates the philosophy and harmony of a traditional Chinese garden with waterfalls, lakes, exotic plants, pavilions and hidden pathways – all within the city. You are most welcome….look forward to seeing some gorgeous photos from your outings! Is there anything more fun for the kids than the ferry? I don’t think so! Great website! !